Marks & Spencer, Britain’s number one clothing retailer, said it was cautious about the outlook for consumers ahead of expected tax rises, as it posted a smaller rise in annual profit than most of its major rivals. The 126-year-old group, which also sells food and homewares, said it was taking market share in clothing and had made a satisfactory start to its new financial year. But analysts want to hear how new chief executive Marc Bolland plans to revive the group’s upmarket food business and take the fight to fast-growing clothing discounters like Primark, and Marks & Spencer (M&S) said he would not outline his initial findings until interim results in November. “We see better value and visibility elsewhere such as Next and Debenhams and feel the shares will drift until Marc Bolland sets out his strategic vision for the business,” said Shore Capital analyst Kate Calvert. Britain’s retailers are emerging from a long and deep recession but fear steps to rein in government debt, like higher taxes, will hit consumer spending in the months ahead. 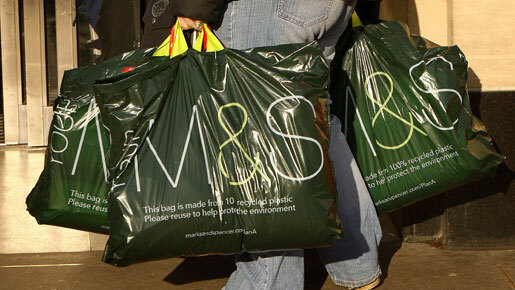 “Consumers are naturally concerned about any impact of the Budget on 22 June,” said Marks & Spencer (M&S) Executive Chairman Stuart Rose, referring to plans by Britain’s new coalition government to announce steps to cut a record state deficit in June. “We therefore remain cautious about the outlook for the year ahead,” he added, though he also thought the British economy would not fall back into recession and was confident M&S would stay in growth. M&S, which serves 21 million Britons a week from over 650 stores and also has about 300 shops abroad, said profit before tax and one-off items rose five percent to £632.5m ($910m) in the 52 weeks ended March 27. That was just ahead of analysts’ average forecast of £628m in a company poll, helped by a 30 basis-point increase in clothing market share to 11 percent. But it falls short of the rises posted by rivals like Next, Debenhams and John Lewis, and underscores the challenges facing Bolland as he looks to rebuild profits towards the £1bn achieved in 2007-8. Bolland joined M&S in early May with a £15m pay package, having previously turned around Wm Morrison Supermarkets through a mixture of marketing, product innovation and business systems improvements. After a particularly tough recession, M&S has fought back by introducing lower-priced “Wise Buys” in food and new clothing ranges like Indigo. Shore Capital’s Calvert expects profits to rise to £660m in 2010-11 and thinks this might increase by £10-15m due to lower financing costs on M&S’s pension. M&S’s sales rose 3.2 percent to £9.3bn and the firm cut its annual dividend to 15 pence a share from 17.8 pence the year before, in line with previous guidance. Rose, brought into M&S to fend off a 400 pence-a-share bid from retail billionaire Philip Green in 2004, is due to relinquish his executive functions at the end of July and leave the company by the end of March 2011. He told reporters he was “absolutely flexible” about the timing of his departure, signalling he could go earlier if a new chairman was appointed quickly.